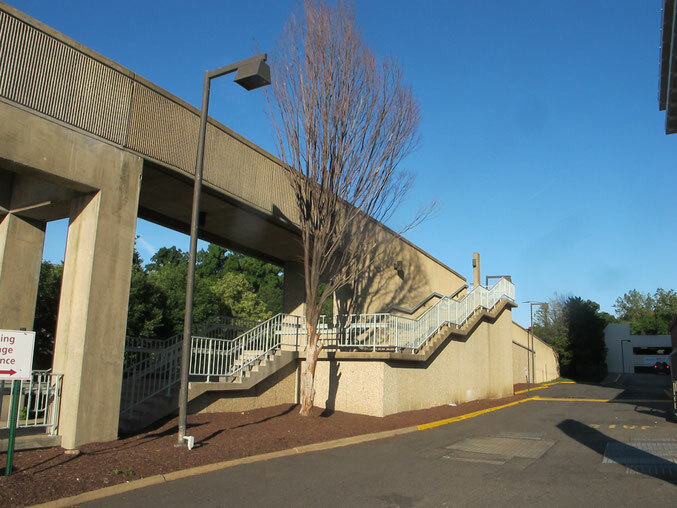 The location is next to a busy intersection in Rosslyn, Virginia which had a pedestrian overpass built to keep people out of harms way. Here is hoping you have some stretches of concrete canvas that are favorites of your own. PS: I have taken photos of this same setting in the winter and found that the green of the grass and the trees in the spring and summer makes this ever so much more attractive. The tree looks like it got hit by lightninng. It's still finding a way to serve a purpose. Center stage on what looks to be a beautiful day! The zigzag of the concrete is pretty cool looking. I don't notice these things unless I am looking at your photos. Its almost like Im now trained to look at things differently when I come to this site. I have to agree with hugger. Looks like an excellent morning. Very practical and smart use, it must cut down on pedestrian traffic quite a bit. We could use something like that around here!!!! Thanks to everyone for your kind comments. Yes, it is amazing what a big swath of clear blue sky can do for almost any subject.